Dan Kindlon, Ph.D., a member of the Harvard University faculty for the past fifteen years, teaches child psychology and conducts research in child development. A leading researcher, Dr. Kindlon has a private psychotherapy practice specializing in boys and their families, and for the past ten years he has been the psychological consultant to an independent school for boys in Boston. Michael Thompson, Ph.D., is a preeminent child psychologist who lectures widely on topics pertaining to the development of boys and also conducts problem-solving workshops with parents, teachers, and students around the country. A highly sought-after consultant to schools, Dr. Thompson is currently the staff psychologist of an all-boys independent school in the Boston area. The coauthor with Edward Hallowell, M.D., of Finding the Heart of the Child, Dr. Thompson has worked for more than fifteen years as a child and family therapist. "Brilliant . . . This affectionate, encouraging book should be require reading for anyone raising--or educating--a boy." "Raising Cain gives a long-needed insight into that mysterious, magical land, the psyches of boys. 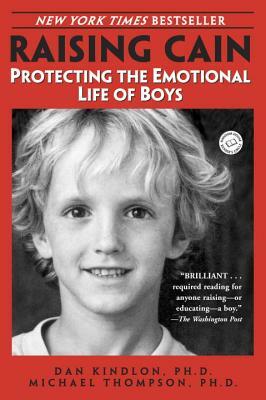 Every parent, teacher--or anyone who wants boys to flourish--should read this book." "ENORMOUSLY COMPELLING . . . In much the same way that Reviving Ophelia offered new models for raising girls, therapists Kindlon and Thompson argue that boys desperately need a new standard of 'emotional literacy.' . . . This thoughtful book is recommended for parents, teachers, or anyone with a vested interest in raising happy, healthy, emotionally whole young men." "RAISING CAIN HELPS US UNDERSTAND THE INNER LIVES OF BOYS MUCH AS MARY PIPHER'S REVIVING OPHELIA SHED LIGHT ON THE STRUGGLE OF THE ADOLESCENT GIRL."